2019 is quickly approaching! If you have considered becoming a business broker in the past but for whatever reason decided to wait – WAIT NO LONGER. Make 2019 the year that you decide to not only open the door to new opportunities but become a business broker and make you own OPPORTUNITIES! The School of Business Brokerage is here to help you start and build a successful business brokerage career. 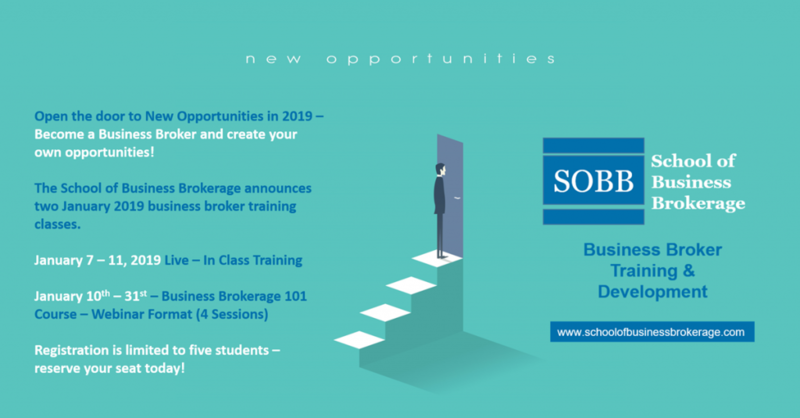 We are pleased to announce two business broker training options in January 2019. Registration is limited to five students – reserve your seat today!